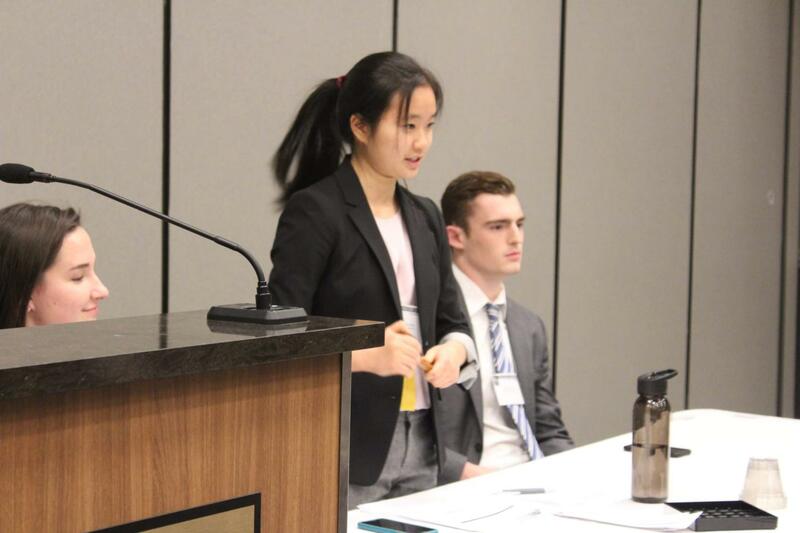 Ceci Gao (12), Lieutenant Governor for JSA Midwest Cabinet, speaks at Fall State. On Dec. 1, 38 VHHS Junior State of America (JSA) members departed to Madison, WI for Fall State. It is Midwest JSA’s largest convention where members can gather, meet each other, and attend events that promote political activism. At the convention, there are keynote speakers, debates, thought talks — student-led discussions — and fundraising events. They also have an activism block, which includes a political fair and legislative round tables. When the convention is held around election times, they register members to vote. As one of three major conventions, Fall State is often the highlight of the JSA experience for members. It’s the first event of every year to meet and bond with members from other schools. “This was my first one, so it was more interesting to meet all the different people from every chapter. You get to meet everyone and see how enthusiastic everyone was about it,” Connor Brennan (9) said. On the flip side of things, Ceci Gao (12) is a JSA veteran, as this was her fourth, and last, time going to Fall State. However, Fall State still holds a special place in her heart. Gao is the Lieutenant Governor for Midwest JSA’s executive board, also called Cabinet. Some duties of her job include running the Cabinet with the Governor, checking in with different departments, and planning events and leadership initiatives. While planning for Fall State with other Cabinet members, she encountered quite a few challenges. “There are always challenges found in working with people that you don’t see a ton because a lot of our relationships and working environments are virtual. Sometimes, there’s communication errors and transportation logistics,” Gao said. JSA is one of the larger clubs at VHHS with about 40 members. For many, JSA is an opportunity to improve their civic engagement and build up their public speaking skills.